Joint problems affect millions of Americans, and manifest particularly through joint pain, as the cartilage between bones starts wearing away. To make your joint more mobile and to enjoy your life without pains and discomfort in your knees, back, and other affected areas, you need to take certain supplements. Rudofil Joint Flexibility Comfort is one such supplement, as it is used mainly for providing relief for pain due to joint degeration. It is also said to increase flexibility, so you can move around with ease, and it can be used long term for better results. Since Rudofil Joint Flexibility Comfort sounds like a good product, we decided to take a closer look at it. What Does Rudofil Joint Flexibility Comfort Contain? Glucosamine Sulfate – the best ingredient for joint health, as it is found naturally in the body, its role being to promote cartilage repair and formation. Curcumin (Turmeric Rhizome Extract) – used by Ayurvedic practitioners for centuries, this natural extract serves as a great pain reliever. Resveratrol – an ingredient with antioxidant properties. As you can easily notice, the list of ingredients is not very long. It is commendable that Rudofil Joint Flexibility Comfort contains glucosamine sulfate that should not be amiss from any joint health supplement. However, besides adding an antioxidant and a traditional extract to the mix, this product does not look extremely potent. In order to see effects, you need to take two caplets of Rudofil Joint Flexibility Comfort daily, one in the morning and one in the afternoon. The manufacturer advises against taking more than the recommended dosage. 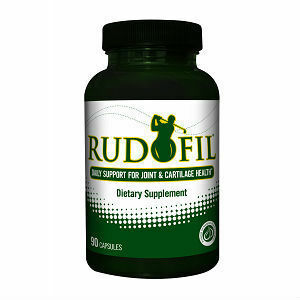 Each bottle of Rudofil Joint Flexibility Comfort contains 90 caplets and it is priced at 54USD. Seeing that you must take two pills daily, one bottle will last for 45 days. You can return your purchased items within 15 days from delivery, but only if they show manufacturing defects. Otherwise, there is no guarantee offered. Rudofil Joint Flexibility Comfort is based on glucosamine sulfate, which is the most important ingredient for joint pains and discomfort, but, otherwise, its formula is not rich in compounds that promote joint health and pain relief. While it may be a good product for joint pains and lack of mobility, there are other, more reliable products on the market. Mark Stevens	reviewed Rudofil	on March 7th	 and gave it a rating of 2.